Our farmhouse is located in the hills of our beloved Colle val d'Elsa, a small gem on the top of a hill in the stunning Tuscan countryside strategically located between the beautiful and world famous cities of Florence and Siena. 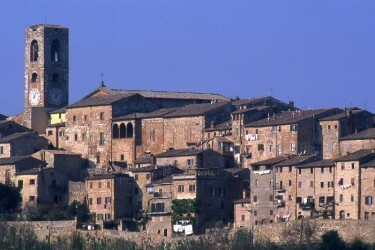 Its older part (upper Colle) is an astonishing testimony of medieval atmosphere, architecture and art, with its city walls and streets surrounding the village centre. The beautiful Palazzo Pretorio (also known as Palazzo del Podestà) built in XIV century with its coats of arms on the facade and frescoes is also the home of the local archeological museum, an interesting occasion to know Etruscan art and culture with its tombal findings and reconstructions. The Museo San Pietro, recently renovated, is the occasion to admire a large collection of paintings and fine arts objects, from sacred medieval to modern pantings witnessing the long and fascinating story of Colle val d'Elsa. Did you know that the worldwide known master architect and sculptor Arnolfo di Cambio, was born here in 1240? His genius is responsable, among many other things, for the original architectural project and the entire decorative apparatus of the original facade of the cathedral of Florence: Santa Maria Del Fiore. Some pieces of this original facade can still be admired in Museo dell’Opera del Duomo, in Florence. Both are less than one hour driving from our location In Colle Val d'Elsa you will dive into the typical Tuscan medieval atmosphere with its tower houses and narrow paved lanes but you can also enjoy an unforgettable dining and drinking experience with its restaurants without forgetting the wine tasting, another experience not to be missed. Colle Val d'Elsa's worldwide known handmade crystal objects will be the perfect occasion for some of your quality shopping. From our famhouse it will be easy and fast to reach other unmissable and unique tuscan goals like the towns of San Gimignano, Monteriggioni and Certaldo.